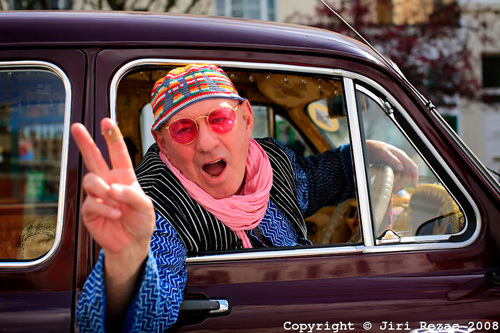 Hippy takes his last trip. For West Londoners the sight of a not so young, roly poly figure in flowing white robes, embroidered cap and brightly coloured Pashmina wrap was a day to day occurance. 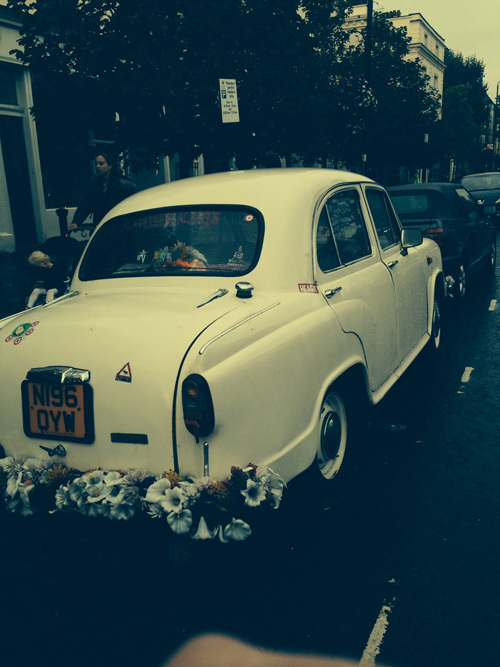 Most probably you might have noticed one of his Karma Kars parked at the Turquoise Island end of Westbourne Grove. Hard to miss. Festooned with garish plastic flowers – a merry clash of unsubtle colours on the outside and interiors in retro Indian restaurant style décor – flocked velvet wallpaper, dusty plastic flowers, incense burners. ‘Getting Lost Is all Part of the Journey’, was a Karma Kars mantra and now sadly a reality. Karma’s founder and ‘creative director, stylist and driver too’, Tobias Moss is now on his final journey after dying of a heart attack in Ibiza, his second favourite ‘spiritual home’ Goa, and the next best place to end his days. No doubt after a night partying and having fun. Rumour has it that his brother is flying a Kab to carry Tobias to his final resting place and an informal memorial ‘goodbye’ will take place in London sometime soon. No doubt in close proximity to Tom’s Café and the Tourquoise Island flower shop. Tobias we miss you but this is the way you would have chosen to make your earthly exit. It brought to mind a couple of others who ‘went the way they would have wanted ‘ – The Dowager Duchess of Devonshire who died a few weeks ago was buried to the music of ‘New York, New York’ along with eggs from her favourite chickens. The funeral was open to all who wanted to come, on a first into the small church basis, and a party in the grounds for staff and visitors. I also love the idea of major L.A. art collector and philanthropist, Marcia Weisman, whose funeral in 1991, was even by L.A. standards brilliantly bizarre. Bemused mourners were unprepared to see Marcia’s body in its casket covered with white lilies in the middle of one of the main galleries in the L.A. Museum of Contemporary Art. She was after all referred to as “Mrs MOCA’ The casket had been placed in front of a forbidding sculpture by Richard Serra, one of the many major works of art donated to the museum by the late patron. You have to applaud her foresight and also her organizational skills. Nothing left to chance or other people. It got THE EYE’s thumbs up. I knew Tobias better and longer than most. Not just London but the whole world is a lesser place without him in it. I told him not to go back to “The Island of Doom” (Ibiza) and Do NOT take anymore of that “poison” his so called friends were giving him. (Ayahuasca and “Bufo Toad” extract, which is poison). I said,” it will kill you and it did”. Unfortunately, Tobias made some bad choices in his life, now he’s as dead as ‘Disco’, in a grave next to someone named Francisco. Such a sad ending —really! RIP Tobias! This is very sad news indeed. The ‘hood is lacking…. The last time I saw Tobias was in Ladbroke Grove last year in his Karma Kab – he stopped in the middle of the road and we had a chat, oblivious to the impatient traffic and aggressive buses! The sad thing is I never got to ride in one of his Kabs, although I offered my services as a driver, having driven the first minicabs in London in 1962… It was always inspiring to talk with Tobias – what a celebration of life! I too tried to contact him on FB for several weeks now. R.I.P. old chum. during all 2014 i did try to reach tobias, but…. i wanted to say good bye, sending several emails. no answer. seeing his interview in goa,his smile by talking about me, i realized, that he had forgiven.